By Harold S. Koplewicz, M.D. I wish I could tell you how to spare your children pain, when they've lost friends or family members, and fear, when disturbing events occur, especially when they're close to home. I can't do that, but what I can do is share what I've learned about how to help children process disturbing events in the healthiest way. As a parent, you can't protect you children from grief, but you can help them express their feelings, comfort them, and help them feel safer. By allowing and encouraging them to express their feelings, you can help them build healthy coping skills that will serve them well in the future, and confidence that they can overcome adversity. Break the news. When something happens that will get wide coverage, my first and most important suggestion is that you don't delay telling your children about what's happened: It's much better for the child if you're the one who tells her. You don't want her to hear from some other child, a television news report, or the headlines on the front page of the New York Post. You want to convey the facts, however painful, and set the emotional tone. Take your cues from your child. Invite her to tell you anything she may have heard about the tragedy, and how she feels. Give her ample opportunity to ask questions. You want to be prepared to answer (but not prompt) questions about upsetting details. Your goal is to avoid encouraging frightening fantasies. Model calm. 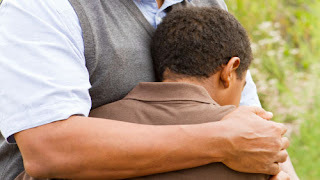 It's okay to let your child know if you're sad, but if you talk to your child about a traumatic experience in a highly emotional way, then he will likely absorb your emotion and very little else. If, on the other hand, you remain calm, he is likely to grasp what's important: that tragic events can upset our lives, even deeply, but we can learn from bad experiences and work together to grow stronger. Be reassuring. Talking about death is always difficult, but a tragic accident or act of violence is especially tough because of how egocentric children are: they're likely to focus on whether something like this could happen to them. So it's important to reassure your child about how unusual this kind of event is, and the safety measures that have been taken to prevent this kind of thing from happening to them. You can also assure him that this kind of tragedy is investigated carefully, to identify causes and help prevent it from happening again. It's confidence-building for kids to know that we learn from negative experiences. Help them express their feelings. In your conversation (and subsequent ones) you can suggest ways your child might remember those she's lost: draw pictures or tell stories about things you did together. If you're religious, going to church or synagogue could be valuable. Be developmentally appropriate. Don't volunteer too much information, as this may be overwhelming. Instead, try to answer your child's questions. Do your best to answer honestly and clearly. It's okay if you can't answer everything; being available to your child is what matters. Difficult conversations like this aren't over in one session; expect to return to the topic as many times as your child needs to come to terms with this experience. Be available. If your child is upset, just spending time with him may make him feel safer. Children find great comfort in routines, and doing ordinary things together as a family may be the most effective form of healing. Memorialize those who have been lost. Drawing pictures, planting a tree, sharing stories, or releasing balloons can all be good, positive ways to help provide closure to a child. It's important to assure your child that a person continues to live on in the hearts and minds of others. Doing something to help others in need can be very therapeutic: it can help children not only feel good about themselves but learn a very healthy way to respond to grief.